The 2016 presidential election. Black Lives Matter. Removal of Confederate monuments. Dreamers and DACA. 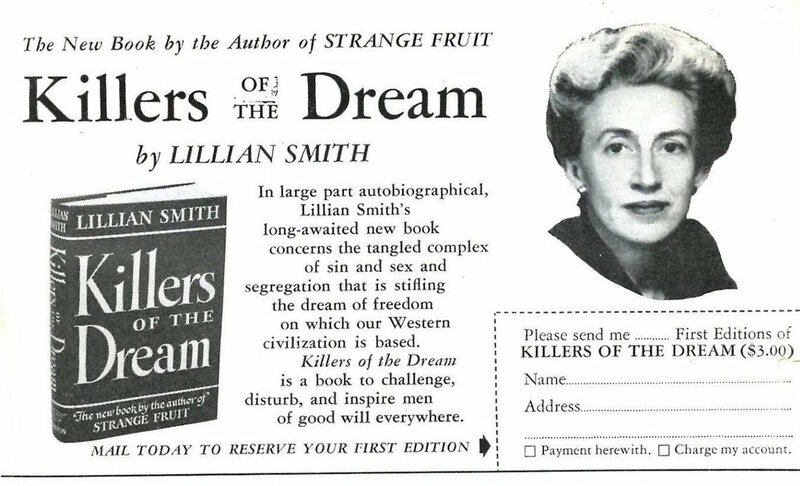 Lillian Smith is still so relevant today. We want to introduce another generation to her story and courage. She influenced countless lives, befriended Civil Rights Movements leaders including Martin Luther King, Jr., and gave a voice to what others were thinking but were too afraid to say in public. She was the first white southern writer to speak about the evils of segregation (in the 1930s), describing the harmful effects on both whites and blacks. This documentary will explore her legacy and the life journey that led to her awakening, from her childhood experiences in the small north Florida town of Jasper, teaching in China, running a girls' summer camp in the north Georgia mountains, to becoming a bestselling author and activist. We're fortunate to have the backing of Piedmont College’s Lillian E. Smith Center and the Georgia Humanities for this project -- as well as fiscal sponsorship through the Southern Documentary Fund -- and look forward to partnering with other groups and individuals in the months ahead. Endnote: Mary Crovatt Hambidge, the subject of my last documentary, and Lillian Smith both lived near Clayton, Ga., in the north Georgia mountains. How this one little mountainous area produced two very independent and outspoken women (no evidence of a friendship there), along with the Foxfire project, is another story.